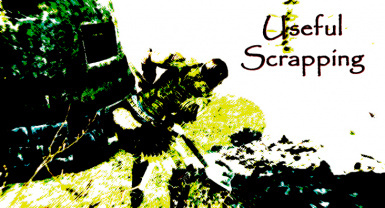 Recycle weapons, armors, misc metallic items, and glass. Craftable alchemical ingredients, lockpicks, and more! Are you suppressing your innate hoarding nature because the world clutter is so useless, with your hoarder-voice screaming in your ear? Come on now dinner plate, why are you so worthless to me?! You're uselessness is a mockery to all the Divines! The mod has an A version, and a B version. The A version is the standard version, with vanilla Skyrim perk requirements. The B version has no perk requirements. Use this verison of you do not want perk requirements, or if you have mods that modify the Smithing perk tree. Clic aquí para la versión en español por v1.2a - Gracias a amiga chefes por traducir! All weapons and armors will breakdown the same amount, the only difference is its material yield. Metallic items are recycled in the Smelter, which will yield a smelt ore chunk. 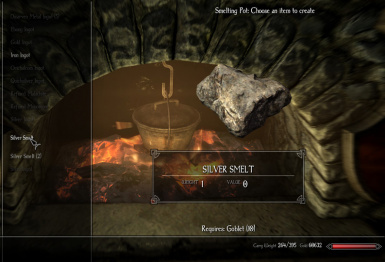 Smelt can then be refined into normal ingots. Leather and hide items are broken down at the tanning rack. Glass items are melted down at the smelter. Stahlrim recycles directly into stahlrim chunks, since it's not mined from ore. Able to smelt cast iron cooking pots, including the kettle, into iron. Silver tableware can be smelted into silver. Added lanterns and Dibella scraping. In the Works for Future Versions. Recycle flatwear, forks and knives. Deconstruct armor; figure out what to do with leather armor. [size=6]As always, Feedback is always appreciated and please Endorse! * Cats Not Included. Arisaka is not responsible for any personal injury, properly damage, or death due to excessive risk factors of hoarding.